New Dopplereffekt album on the way from long time supporters Rephlex Records. ‘Calabi-Yau Spaces’ is listed on their site to be released on LP and CD on 5th March 2007. This will make it the first European release from Dopplereffekt not to appear on Gigolo Records but, on the face of the title alone, the only available info on it I have, it appears more than likely that it will be consistent in continuing its predecessors, 2003’s ‘Linear Accelerator’, scientific/theoretical physics theme. 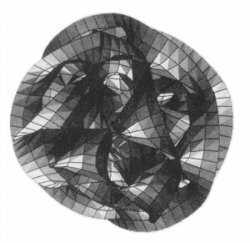 Calabi-Yau Spaces, also known as a Calabi-Yau Manifold, are connected to string theory and are made up of six tightly curled ‘compact’ dimensions of space time. I found an image of one on the web and have reproduced it here.If these type of images are used for the album cover it should prove to be a very attractive artefact indeed. We have another three months to wait so if you feel like researching the subject of Calabi-Yau Spaces for yourself I found three fairly accessible and relatively easy to read for the layman pages which explain the theory, listed below. The first link is the one I would recommend for the reason mentioned and also that it goes into some detail about the concepts of other dimensions as well which might be of help considering what has gone before with Drexciya. I’m sure if you’ve been reading DRL for sometime now your well aware that a dimensional theme was central to Drexciya’s Storm series, each storm said to be a dimensional wave, this also being the name of their so called production company of the time. It’s at times like this that I can’t wait to catch up with where Gerald Donald is right now both conceptually and musically. I’m still wallowing around his releases up to about 2000 right now, which should pay it’s own dividends, but it’s obvious from his work in the last 4 years that there has been a huge crossover between concepts first explored by Drexciya. The crucial difference being that Donald is following a much more scientific route than Drexciya’s more philosophically fanciful one, but it does seem to be towards the same end. Donald is evolution through science while Drexciya envisioned a more spiritual one. To somehow combine the two approaches may be a way through for both mind and body, mental and physical? As ever interesting times lay ahead, here is another reason to look optimistically to 2007. I'm really looking forward this album... I hope it contains the tracks which were played @ La Geode in Paris. i heard it's going to be a 2 lp set.. i hope that the true..
i've heard its going to be a 2 lp set..
i hope that's true.. can't wait..
Dopplereffekt rules! I also like the new project from Black Replica! Gerald Donald rules! Yeah!! !